Super Bowl Sunday is practically a national holiday in this house where we gather with our chosen family to watch the game and, of course, partake in food that evokes modern, American masculinity. This last part is mostly a joke because while we’ve done the chili, and the burgers, and the beer cheese soup (omg, this needs to happen again immediately), it’s also usually my dear femme bestie, Charlotte, and I scouring over our Pinterest boards deciding what we want to eat and what our other guests will put up with. Like, last year we drank raspberry beer spritzers while our beaus looked on in horror and this year there was mention of making homemade cannolis. See how we just went and upgraded Super Bowl Sunday? Boom. This year, I wanted to make something easy, but also totally delicious and absolutely game day appropriate. 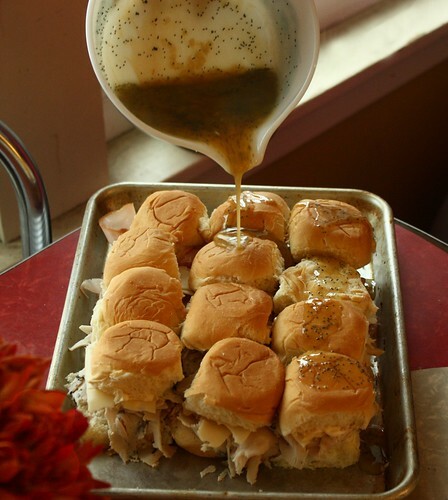 It took all of a quick browse through the supermarket flier to be reminded by a sale on King’s Hawaiian Sweet Dinner Rolls that I wanted to make these sandwiches I had pinned a while back – Funeral Sandwiches! 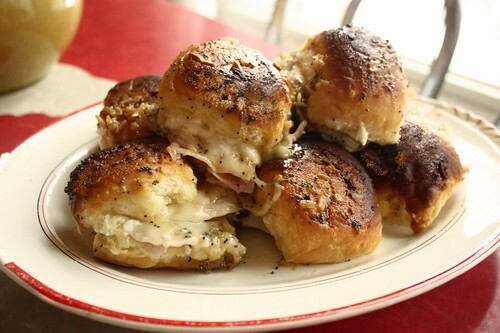 Before Pinterest was born and caused me to love something more than I do my cats, I had heard distant rumor of these beloved little baked ham and cheese sliders. Word in my family is that the long-estranged, now deceased, Aunt Ida, learned to make them when she moved to the South in the 70’s. This was before the schism between her and the family had erupted to the point where culinary boons like this one were no longer shared. 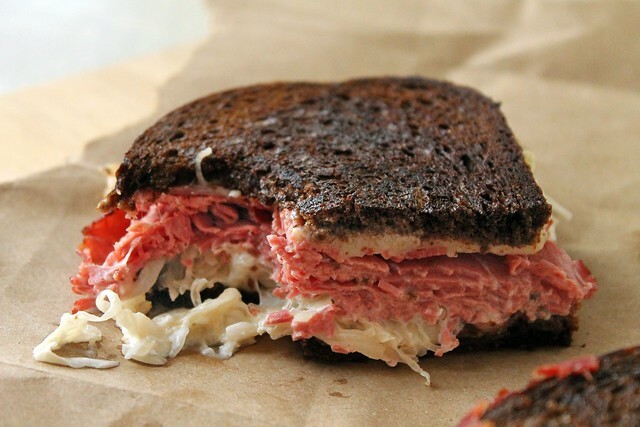 I tried to find the true origin of the funeral sandwich, but all of my fancy (read: Catfish-inspired) Internet research could tell me was that these were a popular food to take to post-funeral luncheons or to provide to a grieving family. I love literal foods. The Super Bowl is a happy time though, so down with the gloom and up with getting these into your mouth immediately! In fact, that’s what Bear and I did tonight. Under the guise of “recipe testing,” we made a batch of these for dinner in order to be certain they were Super Bowl worthy and by god, Aunt Ida, they were! 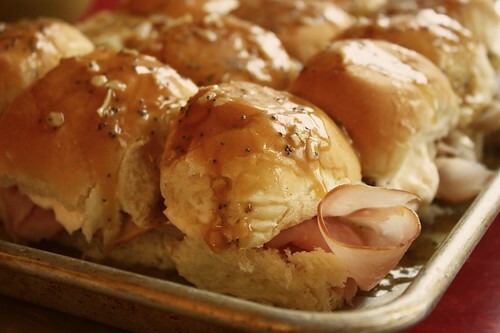 If you are a savory-sweet hound like me, these should go straight to the top of your to-do list because what I’m being awfully coy about in stretching this out, is telling you that they are ham & cheese sliders drizzled with a sweet onion and poppyseed glaze that causes them to bake up all toasty, half crispy and half gooey. 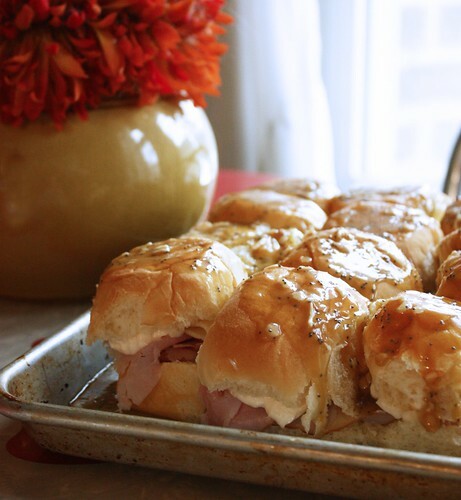 The sweet ham, the tangy swiss, the worcestershire and brown sugar in the marinade…are you drooling yet? I am and I just had them in my mouth a few hours ago. Dang that buttery, savory smell lingering in the air! *Adapted from the many different versions of this recipe found here. Preheat oven to 400°. Select a baking dish that both has an edge and can accomodate 12 sliders, allowing them to touch. I used a quarter sheet pan (13-inches by 9-inches) with a 1-inch edge. Cut rolls in half and line baking dish with bottoms. 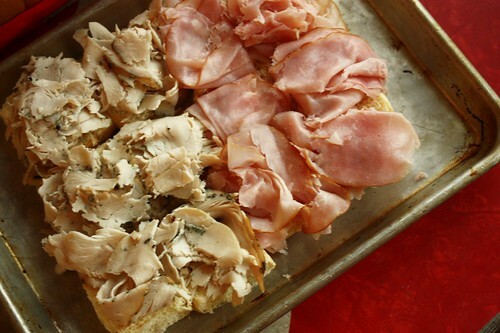 Top each with ham and cheese. 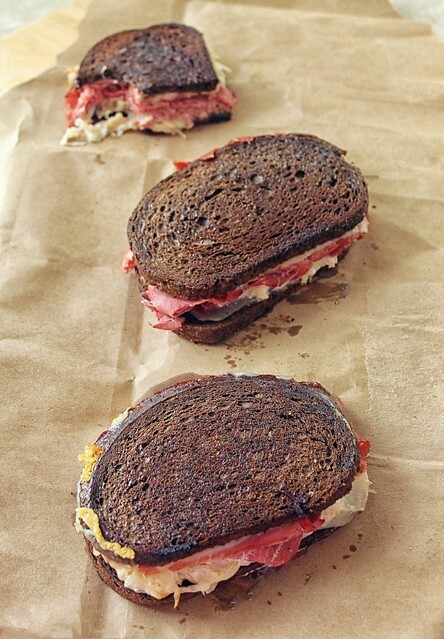 Apply mayonnaise to inside of bun tops and place on top of sandwiches. In a separate bowl, combine melted butter with mustard, onion flakes, worcestershire sauce, brown sugar, and poppy seeds. When combined, pour over the top of the sandwich buns making certain to also get drizzle over the gaps where the sandwiches are slightly touching. Cover pan with aluminum foil. From here, you can either go right into the oven, covered, or put them in the refrigerator overnight to marinate longer. Either way, once they are in the oven, allow them to bake covered for 10 minutes. After 10 minutes, remove foil and allow to continue baking for an additional 5-10 minutes or until tops are brown. Because of the butter, they brown up quickly, so keep an eye on them. If you walk away for a solid 10 minutes without checking, you very well might come back to burnt buns! Once out of the oven, allow to set up for 5 minutes and then dig in! Best paired with ice cold beer and plenty of jokes about tight ends.